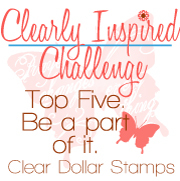 Clearly iStamp: Creative ways to give graduation money! Creative ways to give graduation money! As the school year ends tomorrow for us, I have had several gifts that I have had to give to friends, relatives, and teachers....and I thought I would share my creations with you! As you can tell, this stamp set was designed to make bath products as gifts (which would make a nice graduation present for anyone!). However, I thought outside of the box for this set, and thought it would make a nice graduation seal! The first thing that you need to do is create your saying on your paper. Here is what I wrote....feel free to use it on a scroll of your own! And great things we will see! for you here and in heaven! After you have this printed off on your paper, take the edge scroll from the Heaven Scent set and form the border of your certificate with the Vintage Violet ink. Notice that you can overlap your stamping to create a continuous line. If you are having trouble getting the edging on your block straight, take a piece of masking tape/scotch tape and put in on your block to form a straight line and line your stamp up along that if you don't have any grided blocks. This really helps! To form your "certificate" all you need to do is lay your 8.5x11 paper certificate on the table. Begin taping, with two sided tape, the money to your paper and to the neighboring bill. 1. To cut the scalloped circle you can use the scalloped circle dies from Nestabilities. 2. Stamp your filigree circle stamp from the Heaven Scent stamp set in Versamark embossing pad. Sprinkle with the gold embossing powder. Heat with your embossing gun. 3. I used a brown ink pad and rubbed the edges of the scalloped circle in the ink pad to color the edges. 4. Stamp Congrats in the Cranberry Crisp ink pad on white cardstock. Trim out around the word and glue/tape on top of your seal. I wanted to use pop dots, but decided the scroll would roll better if it were just on there flat. 5. Fold your bill in thirds lengthwise, and then fold in half at a diagonal as shown to place under your seal as your "ribbon". Roll it up into your scroll and tie with a ribbon! It was funny the day I gave this to my friend, someone finally brought it over to him to open so they could all see what it looked like inside. I think it was a hit! Dave said he was going to frame it! LOL! Do you know a graduate that loves chocolate and money? Then this gift would be for you! Now, once you have it in this configuration, you can wrap it with the number one side up, or the "one dollar" in writing side up....just to give variety. Now usually, this box holds eight nuggets....but with the extra bulk of the bills it only holds 3.5 rows of nuggets. So we are going to make a spacer out of card stock. This will keep our nuggets in place AND form the base for our sentiment. Follow the pictures below. I used my Scor-Pal to score my lines for a neat box. Cut a white piece of cardstock 1/2 in x 2 1/2 inch and stamp the Nuggets of Wisdom sentiment from the Sweet Jesus set. Brown the edges with ink. Tape to your spacer, slide in your box. Next, take the R14 ribbon and wrap the edges of your box, taping it on with Scor-tape. This is a super quick and easy gift! Here is another card that I made for another friend who got ordained last Sunday. Go Pastor Tom! Here is a little end of the year teacher gift I made up for the girls to give to each of their teachers. This made up in a jiffy! I, and everyone else, would love to hear or see some creative ways you gave a gift or money! Make sure to make a comment if you have one! Yes! Finally someone writes about make money with pinterest. In your "nuggets of wisdom" where did you all find your nugget box? i Know this is an older post, but I love the "nuggets of wisdom",. Can someone tell me where you get the plastic boxes and what size they are? Thanks for the help. I see this is an old post, but I will try commenting anyway. I got a small treasure chest (mini size that holds candy). I rolled up dollar bills and wrapped with with tinfoil. I even wrapped some coins in tinfoil and put all of those, mixed with the gold wrapped chocolate coins, into the treasure box. This was for a boys birthday and he loved it. I was thinking about writing a post on this exact subject.Thank you. Love your ideas! I have saved them for next year as graduation is over for us this year. What a very "out of the box" creation. Awesome! Wow...what an amazing idea! Love this! Lori you are such a smartie (the tart candy kind too)! Love all these wonderful ideas! I agree with candy... love the Nuggets of Wisdom... would be great for a little "older" birthday gift too. Awesome ideas! I love, love, love the Nuggets of Wisdom (probably because I love chocolate)!